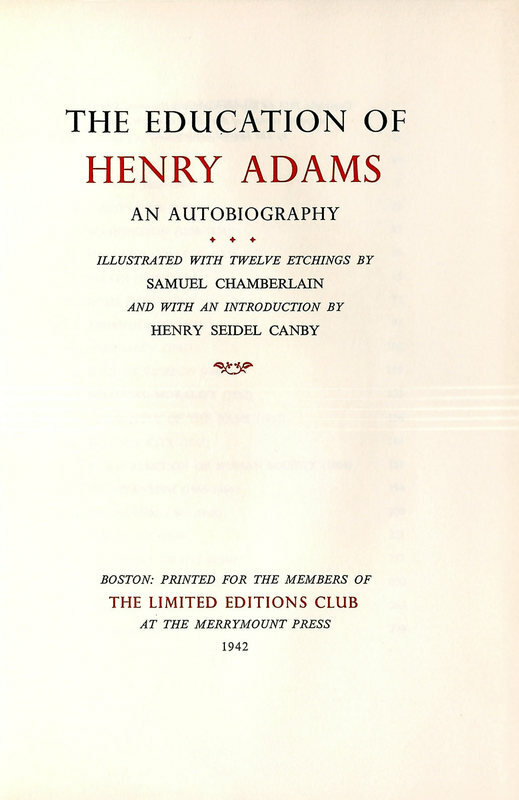 The Education of Henry Adams, an Autobiography; Illustrated with Twelve Etchings by Samuel Chamberlain, and with an Introduction by Henry Seidel Canby. Samuel Chamberlain (1895-1975), who illustrated and signed this edition, worked in collaboration with book designer Daniel Berkeley Updike. Updike, an American typographer, established the Merrymount Press in 1897, first mirroring the work of the Kelmscott Press. He soon shifted his focus to historical works.